The tool that′ ll make your on–page optimization plain to see is WebSite Auditor. You′ ll find it at http://www.link–assistant.com/website–auditor/. WebSite Auditor is easy to use. As you select "Webpages" tab, you have to choose a landing page and enter the keyword you want to optimize it for. If you want to take a deeper dive and examine every single webpage element, click the tab "Page elements" and get ready! Here you′ ll find detailed report on what is found within this or that tag, being it H2–H6 tags. ALT text or Meta Description. 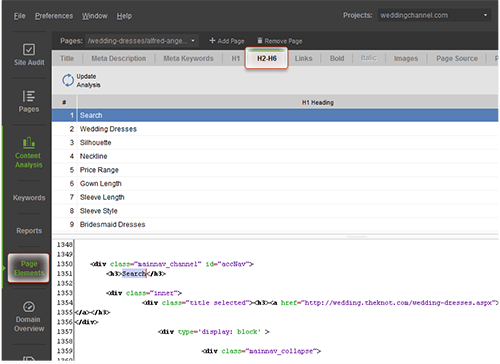 Not only WebSite Auditor displays the list of all the tags, important for on–page optimization, it also lets you peep into the webpage code and see with your own eyes where this or that element is located and how it′ s formatted. Looks a bit too intricate? No prob! You′ ve got the best part of WebSite Auditor as well, which is the Page Structure Audit Report. It explains you every part of your page′ s optimization in plain English. Here′ s what you actually can do and what I ask you to do now: look what you need to change on your page to make it as great for making money as your competitors′ traffic–winning pages. Yes, it′ s right in front of you: if something′ s already fine on the page, this is marked green. And what needs to be changed is left yellow or red, depending on how much it differs from the ideal. Thanks to WebSite Auditor you will not only see areas for improvement, you′ ll also be able to check what your competitors are made of. 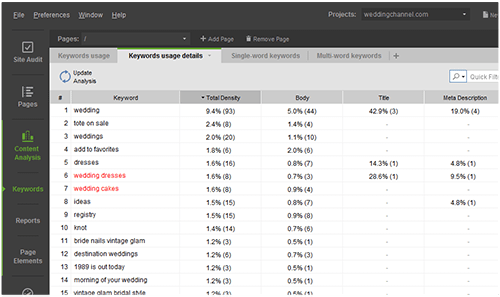 Select the keyword you′ d like to check your optimization rate for, go to Webpage Report tab, and select Page Optimization Audit Report in the dropdown menu on the right. In a clap you′ ll see what brought your competitors to top ranking positions and how well your page is optimized compared to the top 10 ranking pages for the selected keyword. And if you click on a particular element, you′ ll get detailed recommendations on what you should do to rank as high as your competitors. DO IT NOW! Download WebSite Auditor, run a check for your landing page and generate a Page Optimization Audit Report! Took a quick look? Then let′ s get down to work, making the necessary changes and creating an ideal landing page. Ideal is what? Remember? Looking great and natural, and producing good clients! Just wondering how if at all i can find the keywords used on a specific page or atleast the meta keywords? sorry i was meaning on a competitors particular page? The same thing is with competitor website. You are to create a project your competitor site and then analyze a particular page checking all the keywords used, including the keywords. You can feel free to do get this data in WebSite Auditor tool, while analyzing the content of a particular webpage(at the Webpages tab). I have a couple of questions if poss. My website is an online gift registry catering to events such as birthdays weddings baby showers etc. when i get key words they all tend to lean towards the wedding or honeymoon side of things even though my site is more broad than that. Is it possible to pick and choose the words from the list that are more broad? and second question is should i choose the one with highest kei or something with a little less competition but still with green kei? I would recommend you to create 2 keyword lists: one(a broad one) for your homepage to describe your main market niche(wishlist registry); and the second one to describe your categories(I would also recommend you to create a separate webpage for each category). Speaking about the keywords choice, it would be reasonable to start with the keywords with low competition and low # of searches(easy to find and easy to rank), and then when the site starts to rank better, you can take the keywords with higher competition, but with even higher high # of searches. You will have to overcome more competitors,but it will worth the traffic you will get. Hi Dan - Great resource! My question is about the onpage optimization report. It tells me that to optimize my Title section I need to include 18 words and breaks out what words to include. But the other title optimization tools require a limit of about 70 characters in the title, far too few characters to fit in 18 keywords. How do I follow the optimization guidance when it is self-prohibitive? Otherwise, love the tools and this resource site. I would recommend you contact Link-Assistant.Com Support Team( http://www.link-assistant.com/support/) and ask the guys for the solution.I'm sure, they will help you with this question. We've known for a long time that Google doesn't use the Keywords meta tag for rankings, but apparently it doesn't use the Description meta tag either (news to me until someone showed me a post from Matt Cutts back in 2009). So if it is not relevant to rankings do you know why website auditor still has it as a factor within its analysis? As far as I was aware SEO Powersuite was about optimization not marketing. Not seeing where to add keywords for Website Auditor. Has the software changed since this tutorial? What is the importance of capturing or skipping all captchas when using website auditor? Definitely reaching 100% or 90% is not the ultimate goal. You need to keep balance between readability and good keyword density. Taking a look at the most optimized competitor in the list on the bottom of the report page is a good strategy. Try to imitate the most optimized competitors' keyword density as it might differ a bit from the average values, — that would be a safe way to go. Do you really thing that Website Auditor does what Google is looking for, I mean, is quite archaic a search engine to care sooo much about your on-site optimization, when unanimously everybody says LINKS matters. Of course, if you have bad mistakes as too many missing links or bad site structure Google will say yucky and will not come back soon, but the EXTREME approach of Website Auditor to measure keyword density everywhere looks for me very good if you want to rank higher in Excite or other oldies, but not in Google. 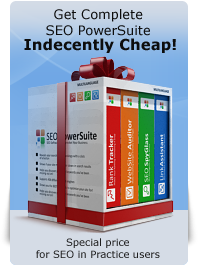 Don't get me wrong, I have bought the tool, I have used it, but from the entire SEO PowerSuite it looks for me as the one that doesn't click - the most useless one. I'm going to be in the same position as Michelle. My site is in a fairly competitive niche. We've been lucky in one respect, that most of the site has been build for us. Now all we have to do is opitimise the pages. I've noticed a lot of the pages we have are for not so good key phrases, so we are going to put a wordpress blog on the back of the site. 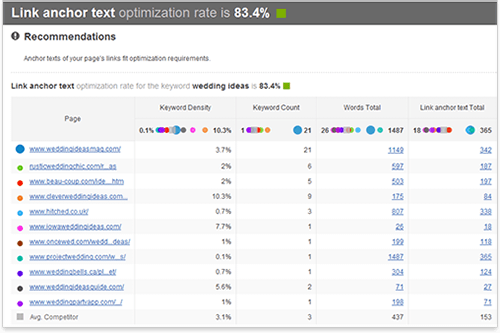 Then we can use the massive list of good keywords, which you have shown us how to find, to build onpage optimised pages. I'm looking forward to the offpage optimisation chapters too.